Conspiracy Theorist And Frequent Presidential Candidate Lyndon LaRouche Dies At 96 LaRouche was connected to bizarre conspiracy theories and ran for president eight times between 1976 and 2004. 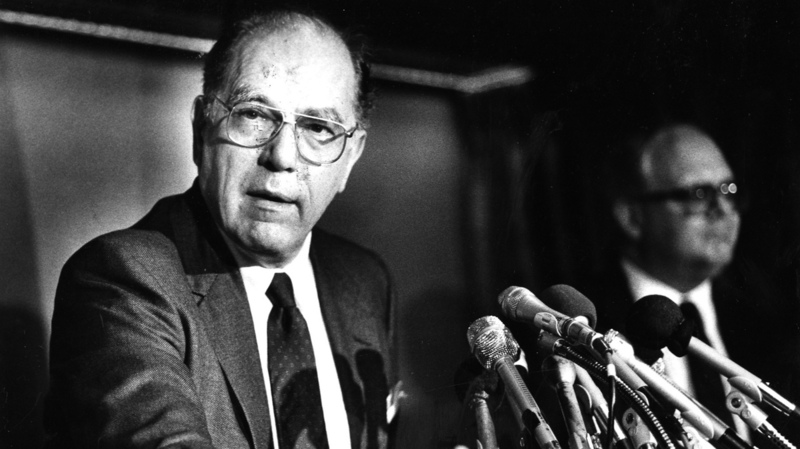 Lyndon LaRouche speaks at a press conference in Washington, D.C. in 1988. He ran for president eight times. Longtime conspiracy theorist and perennial presidential candidate Lyndon LaRouche died on Tuesday at age 96, his organization said in a statement. LaRouche ran for president eight times from 1976 through 2004, running first with the now-defunct U.S. Labor Party and later as a Democrat. His philosophies varied over time, beginning with the far left and then swerving to the far right. Critics accused him of invoking anti-Semitic, racist or homophobic themes. He was prolific in his output of writings and speeches that frequently involved economics. He advocated "a just new world economic order" and imagined that world events were controlled by elites. "Those who knew and loved Lyndon LaRouche know that humanity has suffered a great loss and, today, we dedicate ourselves anew to bring to reality the big ideas for which history will honor him," the Leesburg, Va.-based LaRouchePAC said in a statement Wednesday. LaRouche was connected to an array of odd conspiracy theories, including that the queen of England was involved in international drug trade, and that Henry Kissinger was part of a group of "Soviet agents of influence." In a 1988 story, NPR's Phyllis Crockett reported LaRouche has claimed "only one and half million Jews died in the Holocaust" and that "jazz is a racist musical form invented by whites to enslave blacks." A 1984 profile by the conservative Heritage Foundation estimated his supporters to number only between 1,000 and 3,000 — "a small, but fanatical following." It was common to see LaRouche supporters handing out literature outside Washington, D.C. subway stations in the early and mid-2000s. More recently, LaRouche's organizations have advocated a theory that the U.K., rather than Russia, interfered in the 2016 U.S. election. LaRouche was convicted in 1988 of tax and mail fraud conspiracy after a jury found him guilty of cheating the IRS and his own supporters. He served five years in prison and ran his 1992 presidential campaign from a prison cell. LaRouche's 2004 campaign website described the conviction as "a political show-trial." Dennis King, author of the book Lyndon LaRouche and the New American Fascism, told Fresh Air in 1989 that LaRouche's success in finding supporters shows Americans' "extreme vulnerability to manipulation and infiltration and influence by a cleverly disguised right-wing extremist movement." King said LaRouche and his supporters were "able to make in the 1980s almost unbelievable inroads into American public life." LaRouche and his followers raised over $200 million and ran thousands of candidates for offices across the country, according to King, "more candidates than any extremist group in American history." According to a biography on his 2004 campaign site, LaRouche was born in New Hampshire in 1922. His son Daniel Vincent LaRouche was born in 1956. In 1977, he married Helga Zepp LaRouche, who is listed as the founder of the Schiller Institute, one of LaRouche's many reported political front groups.